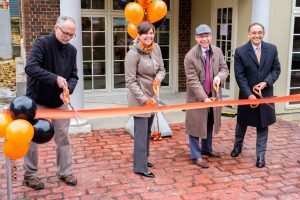 Kalamazoo College students, faculty, staff and administrators conducted a ribbon-cutting ceremony Nov. 13 to celebrate the opening of the College’s new Admission Center. Assistant Vice President of Facilities Paul Manstrom (from left), Director of Admission Suzanne Lepley, Dean of Admission and Financial Aid Eric Staab and President Jorge G. Gonzalez conduct a ribbon-cutting ceremony Nov. 13 at Kalamazoo College’s new Admission Center. The former bed and breakfast at 106 Thompson St., next to West Main and across the street from Dow Science Center, opened to visitors Oct. 23. Still, this gathering recognized how the building reflects the high quality of a K education and comfort for visitors. The Admission Office often is the first point of contact for prospective students and their families as it shares the College’s distinctive programs and opportunities in the liberal arts and sciences, which are developed through the K-Plan. The K-Plan is a nationally recognized open curriculum offering rigorous academics, a hands-on education of experiential learning, international and intercultural experiences such as study abroad programs, and independent scholarship through senior individualized projects. A parking lot adjacent to the building also will be available soon. Until then, parking is available across Thompson Street in the lot in front of the Dow Science Center. Please use the stalls facing Thompson Street marked with signs labeled “Admission Office – Permit Required.” If you have not received a parking permit before your visit, please request one when you arrive at the Admission Center. Prospective students who can’t make it to campus can take a take a virtual tour of K or learn how to connect with Admission. This entry was posted in News Stories and tagged admission, . Bookmark the permalink.